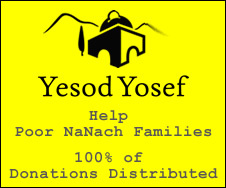 It is almost Shabos so I can't write very much, but B"H there has been great Nanach developments and achievements in the last few days. A new publication of the Story Tales (a thin volume without the Conversations of Saba and Tikun Haklali) was published, a 2,000, for free hafatza. A new unique cover was designed, and it is very impressive B"H. The Nanach putting it out call themselves "The office of publicizing Na Nach Nachma Nachman MeUman LTD."
This year in Meron for Lag Buomer at first glance looked like there was a smaller turn out, but the fact of the matter was that B"H the grounds were expanded giving much more space. Also as the night merged into day and the day progressed the hafatza got better and better and went almost till midnight of the second day. There's more but I mamash gotto go, B"H next week.